Celebrations and ceremonies will be held across the state this weekend to commemorate the birthday of Dr. Martin Luther King Jr. Monday is the official state holiday set aside to honor King’s life and accomplishments. That means politicians of all stripes will be joining arms and walking behind banners and making flowery speeches honoring the legacy of Dr. King, part of it anyway. Gov. Pat McCrory will speak at a breakfast in Burlington. If this year is like previous ones, most of the politicians will reduce King’s message and life to one speech, to one symbol, to one dream and they will water down that powerful call for racial justice. 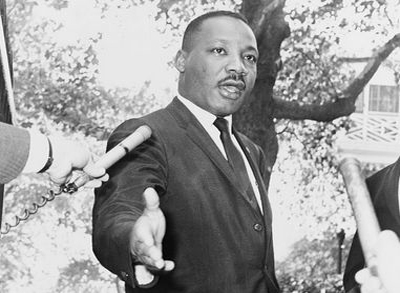 King was talking about Alabama Governor George Wallace refusing to obey a federal court order to desegregate the schools, citing states’ rights and Alabama’s sovereignty in nullifying a federal law he didn’t like. Nullification is still in the news more than 50 years later, a renewed rallying call for many on the Right—and not just the fringe. At a rally outside the Legislative Building on the opening day of the 2013 General Assembly session, leaders of radical tea party groups urged state lawmakers to “honor their oath” and nullify the Affordable Care Act that was passed by Congress and upheld by the U.S. Supreme Court. Many Republican lawmakers attended the event and several addressed the crowd. Robin Hayes, who was then chair of the N.C. Republican Party, publicly thanked the organizers of the rally for their efforts. The words of nullification are still on our leaders lips. Gov. Pat McCrory said at a breakfast a few years ago that Dr. King was a personal hero of his. A few months ago McCrory signed legislation that will deny federal food stamp benefits to more than 100,000 people living on meager incomes well below the federal poverty line. Wonder what McCrory’s hero would have thought of that? King was killed in Memphis where he was fighting for the rights of sanitation workers to organize and speak with one voice. That doesn’t come up in the politicians’ speeches much or their press releases about how much King’s life work means to them to them. They rarely mention his fight for fairer labor laws and higher wages and health care for workers. Public workers in North Carolina still have no right to collectively bargain for better pay and working conditions. State employees haven’t received a meaningful pay raise in years and the state still refuses to follow the lead of 31 other states and expand Medicaid to provide health care for 500,000 low-income adults. Close to one in five people in the state live in poverty and many of them are working hard every day. Raising the minimum wage to even $10 an hour would benefit a million workers in the state but state lawmakers refuse to consider it and McCrory never brings it up. Instead he boasts about cutting unemployment benefits that were slashed so deeply that the percentage of laid off workers in North Carolina receiving benefits is lower than in almost every other state. King surely would not have supported that. And even when it comes to important symbols, the actions of state leaders fall woefully short of their rhetoric about supporting King’s legacy. McCrory received national praise in the wake of the racially motivated shootings in Charleston last summer for saying that the state should stop issuing specialty license plates featuring the confederate flag. But seven months later the state is still selling them and McCrory never mentions the issue any more. There’s more of course, from the backwards march on voting rights to demonizing refugees for political gain. Maybe some of the other speakers at King events this year will connect the dots. Somebody needs to point out the hypocrisy of politicians honoring King with their words and then dishonoring his legacy with their reactionary policies that he spent his life fighting against. Here’s hoping for a more honest King Holiday this year and more importantly, a state that starts living up to his demands for justice.